I don't believe this title. I don't believe there will ever be a "last word" on this most famous of famous women. I just don't think the public will ever forget her, or let her go, and neither will writers from all walks of life, stop writing about her. She made good copy when alive and it seems there'll always be something to write about her in the future - after all, she met a great many people. Her son is the future king of England so no doubt her name will surface from time to time. But, here we go again, someone else who knew Princess Diana and allegedly, someone else to whom she told her innermost secrets. Like Prince Charles being a lousy lover, her stifled life as part of the Royal Family, her suppressed spontaneity, and her very real doubts about actually initially marrying Charles. Author Simone Simmons claims she treated Diana (she's a natural healer and clairvoyant) and during their many sessions they became friends and Diana learned to trust her implicitly. Hence this book. 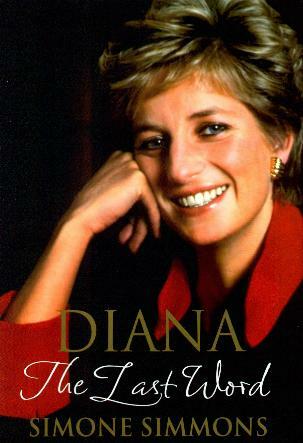 She says that before her death back in 1997, Diana wanted her to write a book and "tell it like it is". Apparently Diana also said, "By the time Harry was born, the marriage was over." Pretty personal stuff. I've been a fan of Diana's since the get-go and think she wasn't really understood, or allowed to be herself. Some of what is written in this book has been rehased a zillion times but other things are extremely intimate and I am saddened that one's "friend" would repeat things that were said in confidence. Subjects she talks about include Diana's marriage, her sons, her lovers, her bulimia, the Royal Family, her charities, her health, and more. Conclusion - No doubt Princess Diana followers will want to read this, but brace yourself.